The Corner Beam ruler is a tool that claims to help you make units like the one shown here. Click the image to Pin for later. 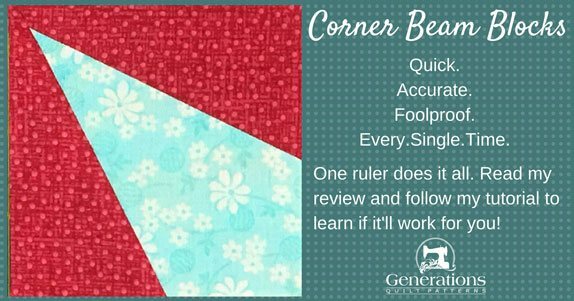 Unlike many rulers that help you either cut accurate patches OR trim accurate patches, the Corner Beam does BOTH. With this one ruler, you're able to cut and trim perfect Corner Beam blocks. These are the extra little things that are helpful to me when using this ruler. They are not contained on the instruction sheet. Immediately after freeing them from the plastic the Corner Beam ruler is wrapped in, make an extra copy of the instructions. I don't know about you, but things around here get buried in the frenzy of a new project. 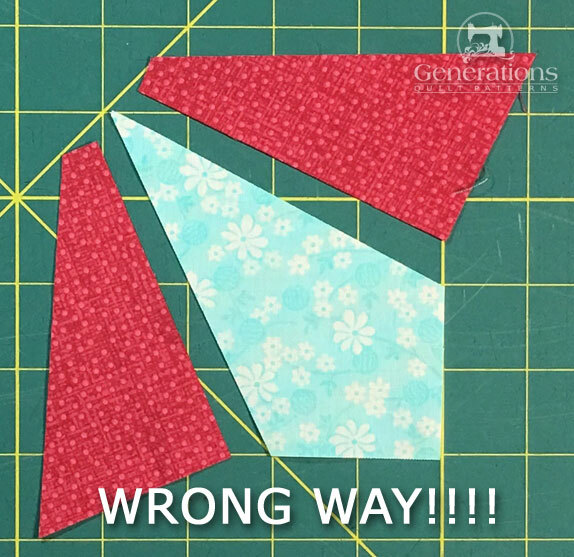 Having an extra copy will save a lot of frustration and missed piecing time. 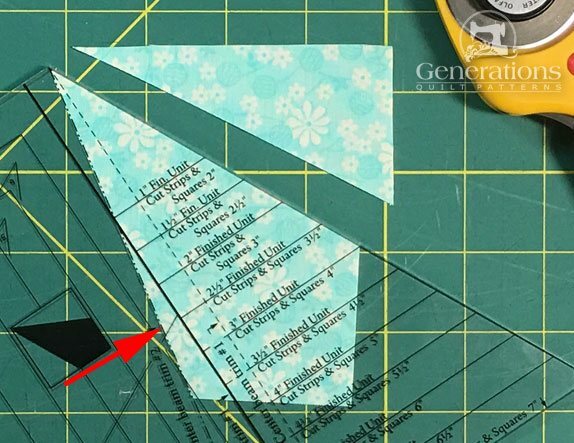 Not only do the instructions provide a detailed step-by-step tutorial, there's a cutting chart that you use each and every time you use your Corner Beam ruler. 2 of the 8 pages of instructions included with the Corner Beam ruler. 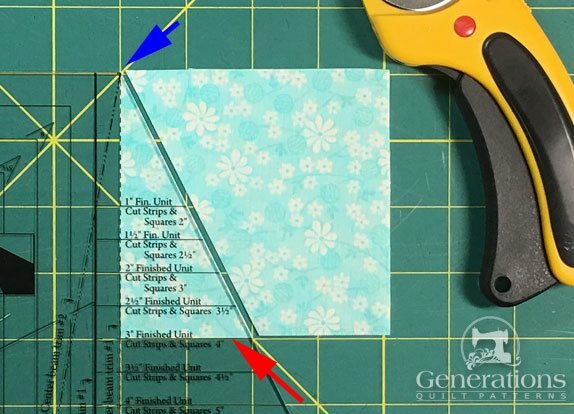 No matter how you cut your patches for this unit—paperpieced, templates or the Corner Beam ruler—starching your fabric before cutting makes stitching much, much, much more accurate. The pointy point of the Beam is quite narrow and easy to pull out of whack. Starch adds needed stability. I like to use StaFlo starch liquid concentrate mixed 1:1 with water. 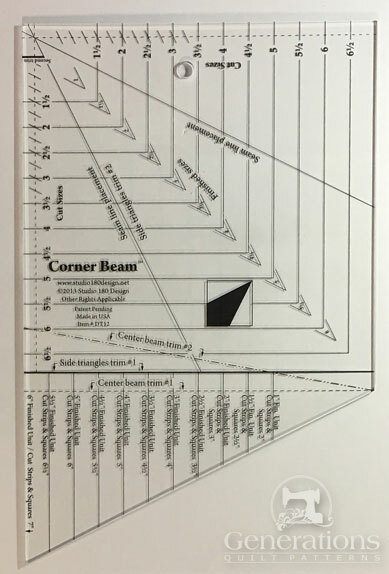 If you're a Deb Tucker fan (the gal who engineered and designed this ruler) and have her 'Spotlight' ruler, the Corner Beam is the new and improved version. Before going any further you'll want to pull out your old Spotlight to compare and contrast any differences. Don't cut huge numbers of patches at one time, regardless of how many layers your cutter will go thru. You're after accurate angles to sew. I cut a max of two layers at one time. For an odd angle like the Corner Beam, accuracy is more important to me than speed. The ruler is a bit big and awkward shaped. If you find yourself really liking the Studio 180 ruler family (as I have recently found for myself) you're going to want to keep them handy—and safe. This is the ruler rack I have (in multiples). Like potato chips, you can't have just one. What is a Corner Beam block or unit? It's a square patch, divided into three equal 30° angles from a single corner point. Both sides of the two internal seams are bias edges. If you've been quilting for awhile, you might remember this unit for the series of 'Thirtysomething' books written by Gayle Bong in the late '90s/early'00s. 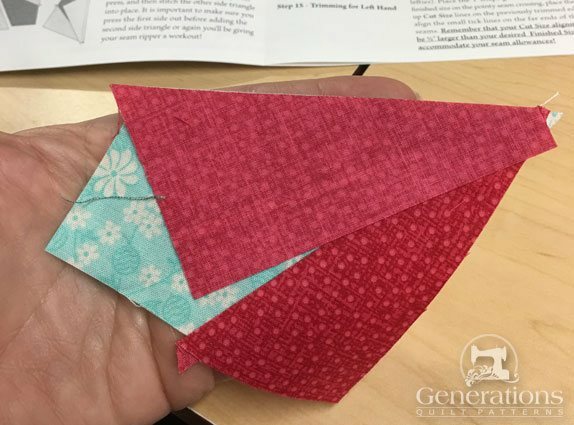 Other reliable methods to piecing this unit are paper piecing and templates. 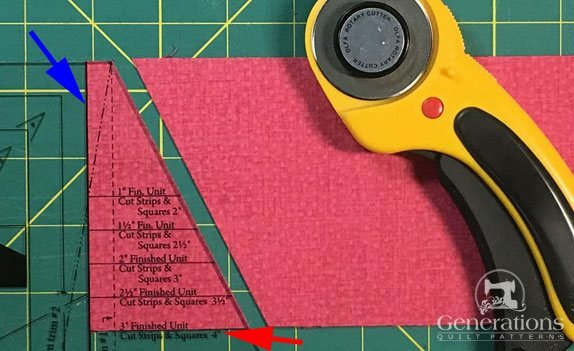 There's no magic to making perfect blocks—just the same old cutting, sewing and pressing you usually do, plus trimming with a well-engineered ruler and sharp rotary blade. All the pieces cut with the Corner Beam are oversized. 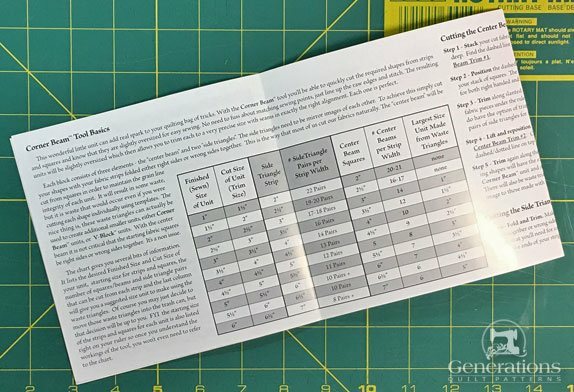 Cutting dimensions for the FSize you want to make are found on both the ruler and instruction sheet. 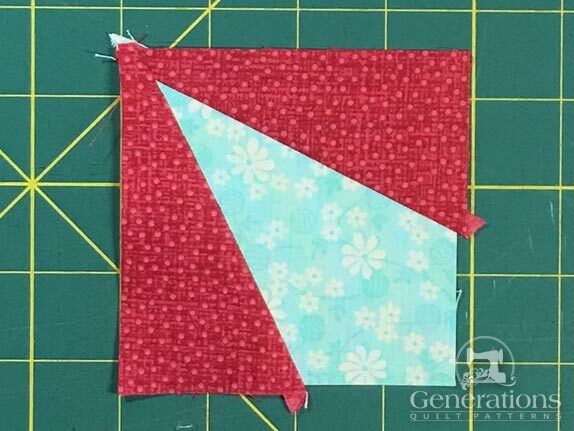 For our 3" finished (3-1/2" unfinished) sample the turquoise 'Beam' fabric is cut 4" square. We need a 4" strip for the red 'Corners'. The instructions also tell you how many patches can cut from a whole strip. 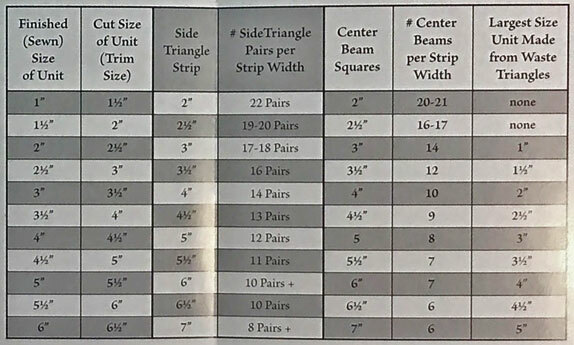 That's a big help if you're calculating how much fabric you need for one of your own designs. Or checking fabric requirements from a commercial pattern. 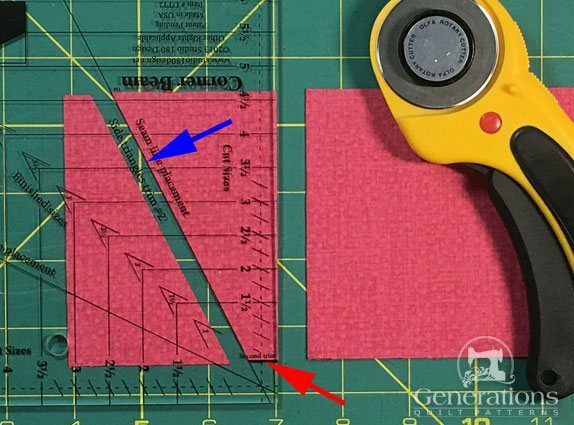 Place the dashed line 'Center Beam Trim #1' (blue arrow) on the lefthand edge of your cut square. The solid 'Finished Unit' line (red arrow) is lined up with the bottom edge. Now rotate the ruler a bit counterclockwise until the dashed and dotted 'Center Beam Trim #2' marking is lined up with your cut edge. The two small triangles are waste. They are too small to use for the same sized blocks. However, you CAN cut them down to use with smaller units. We'll discuss that later in this tutorial and review. Moving on to the red corner fabric. To complete our sample Corner Beam, we need both a right and a left patch. The best, and most efficient, way to do this is to cut thru two layers at one time—either RST or WST—to produce mirror image patches. In the photo below the strip is folded in half lengthwise, WST. 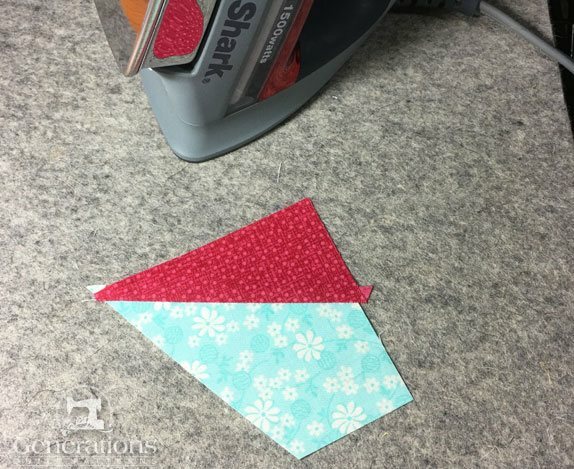 Straighten the short cut edge (through both layers) of the strip. 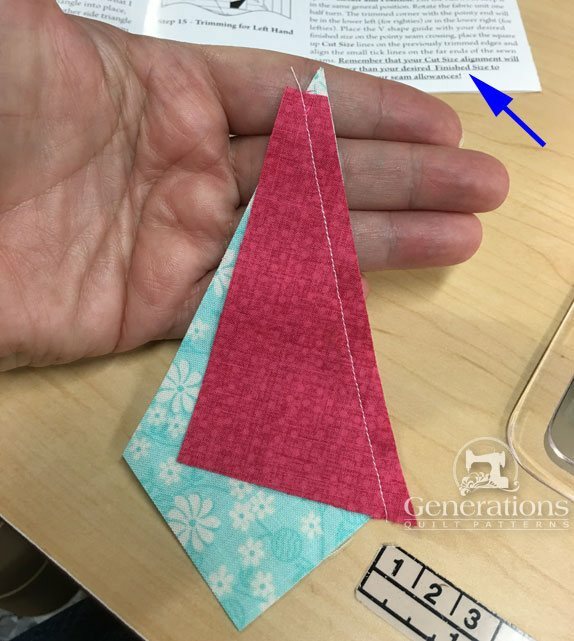 Align the heavy solid 'Side Triangle Trim #1' marking with the cut edge (blue arrow) and the FSize line across the bottom. Your patch will have a flat top when the ruler is aligned correctly. At this point you have enough to make one complete unit. If you're making multiples, flip the ruler. There's lot of lines to choose from. Don't worry. They are all clearly marked. The heavy solid 'Side Triangle #2' mark is aligned with the last-cut edge (blue arrow). The short, heavy solid 'Second Trim' marking aligns with the bottom edge of the strip (closest to you). You've now enough corners for two Corner Beam units. Continue flipping the ruler and cutting for as many blocks you need. 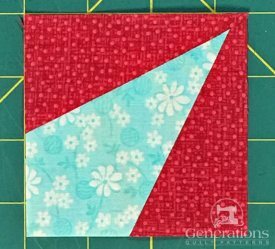 For both seams, stitch from the wide end, not the points. You'll get a much better seam that way. While is doesn't matter which of the corners you add to the Beam first, be consistent if you are making a bunch. It's harder to make mistakes that way. The internal edges are all on the bias and stretchy. Ripping stitches distorts them. Here a pair are stitched together. Notice how a bit of the turquoise fabric sticks out at the top edge. Again, these fabric pieces are oversized so you've got a bit of wiggle room in lining up the patches for sewing. Keep the instructions handy (blue arrow). Press, first flat to set the seam melding the fibers of the thread into the fabric. That padded surface in the photo above is my new favorite pressing tool, The Magic Pressing Mat. It grabs and holds the patches and holds the heat. Really boosts your pressing powers. Now add the second corner to the opposite side in the same manner. Here you can see that same bit of turquoise peeking its point out. With RST add the second corner, pressing the SA away from the center beam to avoid bulk at the point. Looks kind of sloppy right now, doesn't it? There's one more step before this beauty is ready to use. That's exactly how it should look. The perfection comes in the trimming. 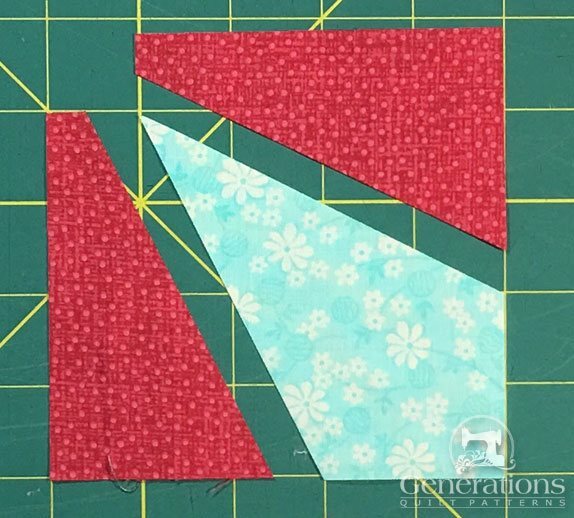 Click here to learn how to use your Corner Beamer ruler for trimming your block.